In 1971, Clem Sunter moved to Lusaka in Zambia to work for Anglo American Corporation Central Africa. From there he was transferred in 1973 to the Head Office of Anglo American Corporation of South Africa in Johannesburg. He spent most of his subsequent career in the Gold and Uranium Division, serving as its Chairman and CEO from 1990 to 1996. At the time it was the largest gold producer in the world. He was until recently Chairman of the Anglo American Chairman's Fund, which in a recent survey was rated the premier corporate social responsibility fund in South Africa. 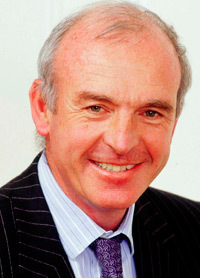 In the early 1980s, he established a scenario planning function in Anglo with teams in London and Johannesburg. Two members were Pierre Wack and Ted Newland who previously headed up the scenario planning department at Royal Dutch Shell and then acted as consultants to Anglo for over a decade (after their retirement from Shell). Using material from these teams, Mr. Sunter put together a presentation entitled 'The World and South Africa in the 1990s' which became very popular in South Africa in the mid-1980s. In it, two scenarios were offered for South Africa: the 'High Road' of negotiation leading to a political settlement and the 'Low Road' of confrontation leading to a civil war and a wasteland. South Africa took the High Road. Two highlights for Clem Sunter were a presentation to FW de Klerk and the Cabinet in 1986 and a visit to Nelson Mandela in prison to discuss the future just before his release. Since 1987, he has authored 14 books some of which have been bestsellers. His other main interest is seeking to mobilise the private sector in the war against HIV/AIDS. He was recently awarded an Honorary Doctorate by the University of Cape Town for his work in the field of scenario planning. He was also voted by leading South African CEOs as the speaker who has made the most significant contribution to, and impact on, best practice and business in South Africa. In 2006, he was invited to give a scenario presentation at the Central Party School in Beijing - a rare privilege for a foreigner. He also facilitated sessions on global warming in New Delhi and London. Clem Sunter married Margaret Rowland in 1969 and they have one daughter and two sons. His hobbies include music and golf. Hire Corporate Entertainment - We only have South Africa`s TOP Artists - Hire a Comedian, Master of Ceremonies, Live Bands, Dance Acts- Hire a Magician - We have the very BEST in Live Entertainment for your function or event.